The first details of a new standard for accessing non-volatile memory emerged at the Intel Developer Forum 2007, when NVMHCI was shown as the host-side protocol of a proposed architectural design that had Open NAND Flash Interface Working Group (ONFI) on the memory (flash) chips side. A NVMHCI working group led by Intel was formed that year. The NVMHCI 1.0 specification was completed in April 2008 and released on Intel's web site. Technical work on NVMe began in the second half of 2009. The NVMe specifications were developed by the NVM Express Workgroup, which consists of more than 90 companies; Amber Huffman of Intel was the working group's chair. Version 1.0 of the specification was released on 1 3 2011, while version 1.1 of the specification was released on 11 10 2012. Major features added in version 1.1 are multi-path I/O (with namespace sharing) and arbitrary-length scatter-gather I/O. It is expected that future revisions will significantly enhance namespace management. Because of its feature focus, NVMe 1.1 was initially called "Enterprise NVMHCI". An update for the base NVMe specification, called version 1.0e, was released in January 2013. In June 2011, a Promoter Group led by seven companies was formed. The first commercially available NVMe chipsets were released by Integrated Device Technology (89HF16P04AG3 and 89HF32P08AG3) in August 2012. 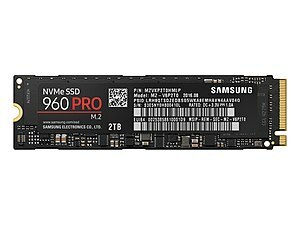 The first NVMe drive, Samsung's XS1715 enterprise drive, was announced in July 2013; according to Samsung, this drive supported 3 GB/s read speeds, six times faster than their previous enterprise offerings. The LSI SandForce SF3700 controller family, released in November 2013, also supports NVMe. Sample engineering boards with the PCI Express 2.0 ×4 model of this controller found 1,800 MB/sec read/write sequential speeds and 150K/80K random IOPS. A Kingston HyperX "prosumer" product using this controller was showcased at the Consumer Electronics Show 2014 and promised similar performance. In June 2014, Intel announced their first NVM Express products, the Intel SSD data center family that interfaces with the host through PCI Express bus, which includes the DC P3700 series, the DC P3600 series, and the DC P3500 series. 2014年11月 (2014-11)現在[update], NVMe drives are commercially available. In March 2014, the group incorporated to become NVM Express, Inc., which 2014年11月 (2014-11)現在[update] consists of more than 65 companies from across the industry. NVM Express specifications are owned and maintained by NVM Express, Inc., which also promotes industry awareness of NVM Express as an industry-wide standard. NVM Express, Inc. is directed by a thirteen-member board of directors selected from the Promoter Group, which includes Cisco, Dell, EMC, HGST, Intel, Micron, Microsoft, NetApp, Oracle, PMC, Samsung, SanDisk and Seagate. The table below summarizes high-level differences between the NVMe and AHCI logical device interfaces. The position of NVMe data paths and multiple internal queues within various layers of the Linux kernel's storage stack. 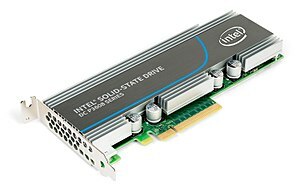 Intel sponsored a NVM Express driver for FreeBSD's head and stable/9 branches. The nvd(4) and nvme(4) drivers are included in the GENERIC kernel configuration by default since FreeBSD version 10.2. With the Release of the iPhone 6S and 6S Plus, Apple Inc.introduced the first mobile deployment of NVMe over PCIe in smartphones. Apple followed these releases with the release of the iPad Pro and iPhone SE that also use NVMe over PCIe. Intel published an NVM Express driver for Linux, which was merged into the Linux kernel mainline on 19 March 2012, with the release of version 3.3 of the Linux kernel. A scalable block layer for high-performance SSD storage, known as blk-multiqueue or blk-mq and developed primarily by Fusion-io engineers, was merged into the Linux kernel mainline in kernel version 3.13, released on 19 January 2014. This leverages the performance offered by SSDs and NVM Express, by allowing much higher I/O submission rates. With this new design of the Linux kernel block layer, internal queues are split into two levels (per-CPU and hardware-submission queues), thus removing bottlenecks and allowing much higher levels of I/O parallelization. 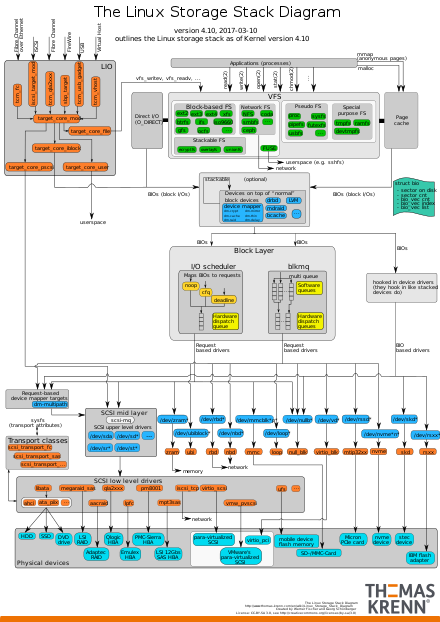 As of version 4.0 of the Linux kernel, released on 12 April 2015, VirtIO block driver, the SCSI layer (which is used by Serial ATA drivers), loop device driver, unsorted block images (UBI) driver (which implements erase block management layer for flash memory devices) and RBD driver (which exports Ceph RADOS objects as block devices) have been modified to actually use this new interface; other drivers will be ported in the following[どれ?] releases. NetBSD has support for NVMe in development version (NetBSD-current). Implementation is derived from OpenBSD 6.0. Development work required to support NVMe in OpenBSD has been started in April 2014 by a senior developer formerly responsible for USB 2.0 and AHCI support. Support for NVMe has been enabled in the OpenBSD 6.0 release. In the 10.10.3 update for OS X Yosemite, Apple introduced support for NVM Express. The Retina MacBook uses NVMe over PCIe as the logical device interface. Solaris received support for NVMe in Oracle Solaris 11.2. Intel has provided an NVMe driver for VMware, which is included in vSphere 6.0 and later builds, supporting various NVMe devices. As of vSphere 6 update 1, VMware's VSAN software-defined storage subsystem also supports NVMe devices. The OpenFabrics Alliance maintains an open-source NVMe Windows Driver for Windows 7/8/8.1 and Windows Server 2008R2/2012/2012R2, developed from the baseline code submitted by several promoter companies in the NVMe workgroup, specifically IDT, Intel, and LSI. The current release is 1.4 from December 2014. ^ NVM Express specification revision 1.2. section 1.4 Theory of Operation. http://nvmexpress.org/wp-content/uploads/NVM_Express_1_2_Gold_20141209.pdf.